In addition to the leaked investigation, Morgenson makes a critical point about ongoing federal and state attorneys general efforts for settlement order on mortgage fraud, fictional mortgage agreements, and matters related to ForeclosureGate. There is a tight fit between the illegal acts and the subject matter of those acts in both Cuomo's case and the attorney general's direction, according to the Morgenson article. Selling troubled securities without disclosure is precisely the type of fraud that Cuomo charged against Bank of America - defrauding investors on a deal by withholding vital information. The information withheld in the Bank of America case concerned the huge losses Merrill had incurred in the collateralized debt obligation (CDO) and mortgage backed securities (MBS) market. 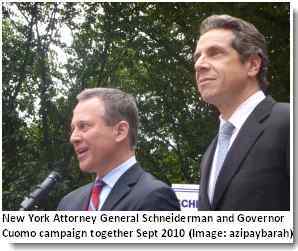 Schneiderman's focus benefits from the groundwork laid by Cuomo's 2009 action. That's a considerable benefit given the depth of interviews and analysis in Cuomo's New York complaint. The attorney general can also call on the contributions of former Special Inspector General for TARP, Niel Barofsky. The former SIGTARP collaborated wiht Cuomo in the Bank of America complaint. Schneiderman also has the benefit of exhaustive evidence developed by the Senate's Permanent Subcommittee on Investigations. Should he file a complaint, the attorney general of New Your will have a solid foundation preceding his efforts. Using these resources provides the opportunity for broad based civil and criminal actions . The infrequently used law was the centerpiece of Elliot Spitzer's investigations into Wall Street fraud as New York AG, prior to his election as governor. Had Spitzer survived, it would have produced an array of fraud cases prior to the financial crisis. If wishes were horses, we'd all take a ride. Spitzer's investigations blew up after a personal scandal. Cuomo's gubernatorial campaign interrupted his Bank of America case of 2009. Sheer has been around long enough to know the odds against the good guys winning, at least for long enough to make a difference. But you never know. Success is often a matter of timing. This attorney general is certainly attacking Wall Street and the big banks at the right time. The support for serious legal action would be overwhelming. There isn't be a venue in the country that would miss the opportunity to sock it to these and other institutions and put a some of their officials behind bars. Of note, the Martin Act can be used for civil and criminal prosecutions. But let's not get carried away. Trillions lost, a nation in economic distress, 150,000 foreclosures a month…and how many prosecutions have we seen? The only time these guys will do is in a Timex commercial. This article may be reproduced entirely with attribution of authorship and a link to this article. Taibbi is one of the few journalists still pounding on Goldman Sachs pointing out they lied to Congress and their customers. Good video interview below. Thanks for keeping the bankster issue alive. There are many a crook and criminal within those Wall Street rooms and many need to visit Bernie Madoff. I was surprised that Schneiderman was willing and able to fight the banksters on their own turf. Cuomo knows the score as well, so it's good that the two of them are on the same page. I am looking forward to the details of the investigation. They've got the whole game rigged but now their time may come. I was impressed that Cuomo went after BofA in a big way. He also got settlements out of a number of financial institutions. But Schneiderman doing the Martin Act interviews with Goldman, BofA and Morgan is another story. The act allows intensive questioning and requires those interviewed to keep quiet. If they don't, then they're up for violating that part of the act. I'm sure Schneiderman and Cuomo have good motives. This is a politically charged investigation and prosecution, if they move forward. I'm also sure that they can both count. There are a far more New Yorkers hurting than banksters hustling. In this case, I'll actually "hope" for a while. BTW, Cuomo's popularity rating was above 70% after his budget cuts. Interesting.